Swiss Army knife: These multi tools have pretty much been my standard kit for 20 years. You get all sorts of blades, screw drivers, tweezers, bottle openers etc. The smaller versions have a key ring on and can be hung on the caribeener. Mine is a fitting camo one. Mini Maglite : The mini Maglite is not as bright as the bigger ones but gives off a pretty strong beam. This one has a key ring on too. While it is a battery one, taking two AAA’s, they do last a fair while depending on use. Fire stone: Shaun Harrison showed me this when we shot the “Week in France” video. These have a flint stone and steel striker, and can light your stove or fire even in the dampest conditions. Matches get wet easily, BIC lighters don’t always work in the wet, even if they dry out… but the flint gives you a good spark in all conditions. Small Button Compass: For swim choice it is often a good idea to know where the north is to give you an idea of dominant winds, where the sun rises and sets etc. This can be easy on waters where the visibility of the horizon or sun is good, but in heavily wooded lakes or on very cloudy days it can sometimes be hard to see which the north. 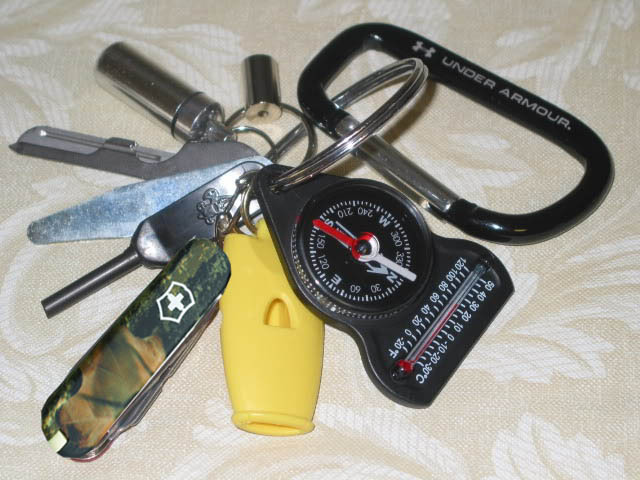 A small key ring compass is the answer. It weighs very little and is a good addition to our Carp Anglers EDC. 15m of Paracord: Some kind of cordage is often useful in a fishing situation, for repairing things tying brollies down making a quick washing line for wet clothes. The list is endless. I recently broke the leg on my Titan but was able to whip it with a guy rope and it was strong and functional for the session. A good strong cord is then very useful and the best stuff is the tried and test paracord. It’s cheap and can be taped up with some duct tape or electrical tape and added to the kit. A Keyring Container for Water Purification Tablets: These little key fob pill containers are useful for keeping a few water purification tablets in. In the old days we made lake water tea & coffee all the time but these days with awareness about Weils disease and other water born nasties its not something I’d do on a regular basis. But if you are stuck on a remote swim and you are short of water, the lake or river may be your only option until you can get fresh water. Now its stupid to drink it without boiling for a 1 minute or so, but if you add a tablet it, leave it for the 30 minutes needed to kill the possible nasties in the water this will stop you getting ill, if you are unable to boil it properly. Basically you take a cotton wool ball, you can get in any supermarket, and rub it with knob of petroleum jelly, making sure it is well imbibed with the product. You can make a dozen or so of these, scrunch then down small and stuff them into a large sized key fob tube. If you need to start a fire you simply add a ball or two to a bundle of dry grass and stick and you can light a fire with a quick strike of your fire stone or cigarette lighter. The wool will burn for a couple of minutes thus giving you time to pile on the small dry wood and build up your fire/BBQ. So basically you can build up your own kit. I’m sure everyone will have their own favourite gadgets to make life on the bank easier and more comfortable. But in remote areas on big waters in France, these items could save your life. If we have teh ability to produce safe drinking water and fire at all times then, one need not ever be in danger in the outdoors.